Princesses need to study and do homework, but who says they can't have their own luxurious desk? This expansive desk set features a matching hutch and chair to make any little girl feel like royalty. The desk offers four side drawers and a wide center drawer to place all her writing utensils, papers and more. The hutch features exquisite detailing to match the desk and chair while also offering three wide shelves to help organize her room. The tall design uplifts the entire piece while the chair features padded, striped fabric to ensure a beautiful match. The delicate designs and motifs are all hand-brushed gold to provide an elegant contrast to the pearl white finish. 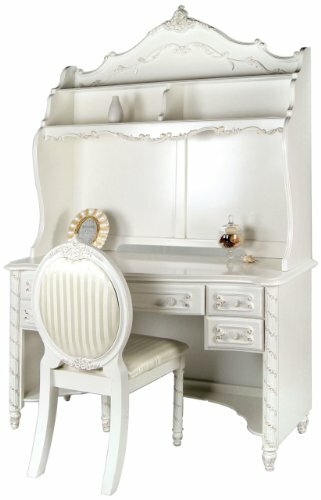 Your princess will feel right at home with her desk set that can double as a vanity. Manufactured in Vietnam, some assembly required. Desk: 50"W x 20"D x 31"H; Hutch: 47.25"W x 12"D x 48.38"H; Chair: 17.75"W x 20.25"D x 39.5"H. Decor not included.